The global aircraft landing gear market is projected to grow from USD 9.71 Billion in 2016 to USD 13.14 Billion by 2021, at a CAGR of 6.23% from 2016 to 2021. The objective of this study is to analyze, define, describe, and forecast the global market based on type, platform, application, aircraft type, and region. The report also focuses on the competitive landscape of this market and presents profiles of companies on the basis of their financial positions, product portfolios, growth strategies, core competencies, and market shares, to anticipate the degree of competition prevailing in the global aircraft landing gear market. 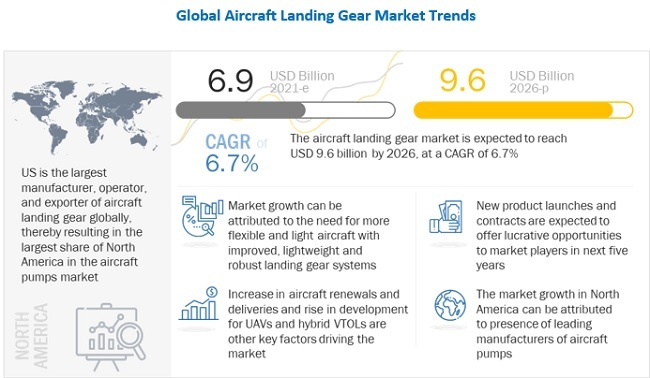 This report also tracks and analyzes growth strategies, such as partnerships, mergers & acquisitions (M&A), new product developments, and research & development (R&D) activities undertaken by the key players in the global aircraft landing gear market. In this report on the global market, 2015 has been considered the base year and the forecast period taken into account is from 2016 to 2021. The ecosystem of the global aircraft landing gear market comprises type, and application. The aircraft landing gear value chain includes raw material manufacturers, such as UTC Aerospace System, (U.S.), MOOG Inc. (U.S.), and Parker Hannifin Corporation (U.S.), among others. The key players operating in the market include Safran S.A. (France), Liebherr-International AG (Switzerland), CIRCOR International, Inc. (U.S.), Héroux-Devtek Inc. (Canada), UTC Aerospace Systems (U.S.), and Triumph Group, Inc. (U.S.), among others. Contracts and acquisitions are the major strategies adopted by the key players to strengthen their positions in the global aircraft landing gear market. This report aims to help manufacturers, suppliers, and distributors of aircraft landing gear, as well as sub-component manufacturers to identify the revenue pockets in this market. The global aircraft landing gear market is projected to grow from USD 9.71 Billion in 2016 to USD 13.14 Billion by 2021, at a CAGR of 6.23% from 2016 to 2021. The increasing demand for new aircraft from regional airline companies in the Asia-Pacific and Middle-Eastern regions, procurement of fighter aircraft and unmanned aerial systems in military programs across the world, are the key factors driving the demand for aircraft landing gear across the globe. China, Canada, Brazil, and Japan are the key countries expected to witness significant growth in the global market during the forecast period. Based on platform, the aircraft landing gear market has been segmented into fixed wing, and rotary wing aircraft. The rotary wing segment is projected to grow at the fastest rate in the global aircraft landing gear market during the forecast period. The growth of the rotary wing segment can be attributed to the increasing demand for helicopters from the military sector. Demand for helicopters can be attributed to the increasing application of helicopters for transport, emergency medical services, and special missions. 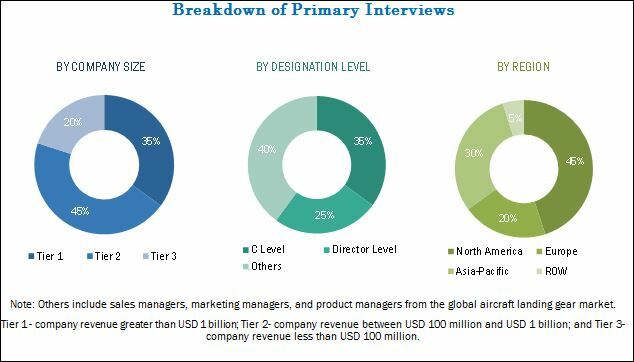 Based on application, the commercial aviation segment is expected to account for the largest market share of the global market during the forecast period. The commercial aviation segment consists of narrow body, wide body, very large aircraft, and regional transport aircraft. The increasing demand for new aircraft from regional airline companies in the Asia-Pacific and Middle-Eastern regions is one of the key factors driving the market. The increasing air passenger traffic as a result of rising affordability is resulting in the demand for new aircraft, in turn influencing the market growth positively. The North American region is estimated to lead the global market during the forecast period, owing to technological advancements taking place in aircraft landing gear and the presence of key aircraft manufacturers, such as The Boeing Company (U.S.) and Bombardier Inc. (Canada). Increasing aircraft orders from these manufacturers by the regional airline companies in the Asia-Pacific and Middle-Eastern regions is driving the growth of the North American aircraft landing gear market. Growing military modernization programs, which include the increased procurement of advanced fighter jets, and unmanned air vehicles, among others is also expected to drive the North American market during the forecast period. Existing aircraft production backlog is a key factor expected to restrain the market growth during the forecast period. The global aircraft landing gear market is a diversified and competitive market with a large number of players operating in it. The key players operating in the global market are, Safran S.A. (France), Liebherr-International AG (Switzerland), CIRCOR International, Inc. (U.S.), Héroux-Devtek Inc. (Canada), UTC Aerospace Systems (U.S.), and Triumph Group, Inc. (U.S.), among others. 13.10 GKN Aerospace Services Ltd.
13.11 SPP Canada Aircraft, Inc.